It could be a sign of the times – or something more lasting – but far more Americans today feel like their side is losing more often than winning in politics. In our new survey examining the public’s attitudes about government, just 25% say that, “on the issues that matter,” their side has been winning more often than it has been losing. 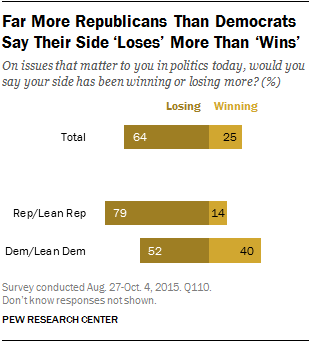 More than twice as many (64%) say their side loses more often than it wins. The feeling that political losses outnumber victories is widely shared across demographic groups. Substantial majorities of men (66%) and women (62%) feel like their side loses more than it wins. And there are only modest differences when it comes to race and ethnicity: 66% of whites, 65% of blacks and 59% of Hispanics all say their political side loses more often than it wins. Yet there are clear partisan differences – fully 79% of Republicans and Republican-leaning independents say their side loses more often than it wins, compared with 52% of Democrats and Democratic leaners. This is yet another indication of the broad dissatisfaction Republicans express toward politics, a feeling that extends to views of the GOP-led Congress and their own party. While Republicans hold majorities in both the House and Senate, favorable ratings for Congress – while extremely low among members of both parties – are lower among Republicans (23% favorable) than Democrats (31%). In addition, more Republicans than Democrats continue to view their own party unfavorably (31% vs. 19%). Overall, about half of Democrats and Democratic leaners say their side in politics loses more than it wins, and this sentiment is especially widespread among Democrats with lower levels of education. A majority of Democrats with no more than a high school education (59%), as well as those with some college experience (54%), say their side loses more than it prevails. 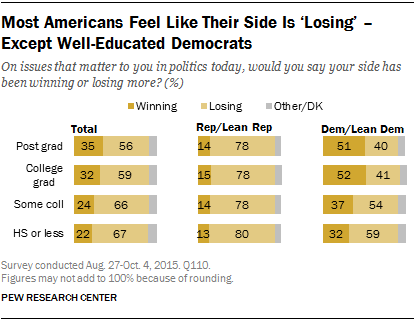 Among the only groups who feel like they’re winning are well-educated Democrats. Those with at least a college degree are more likely to say they feel like their side is winning (51%) than say it’s losing (41%). In general, younger people are more likely than older people to feel their side is winning: About a third of those under 50 (30%) say their side wins more than it loses compared with 20% of those 50 and older. 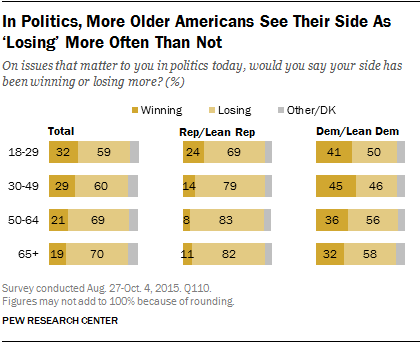 Older Republicans are more likely than younger Republicans to see their side as losing in politics today. Still, a majority of Republicans under 30 (69%) do hold this view, and they are much more likely to say this than their Democratic counterparts. Just half of young Democrats say this. What we found – perhaps not surprisingly – is that, in general, feelings of political “losing” are associated with higher levels of anger toward government. 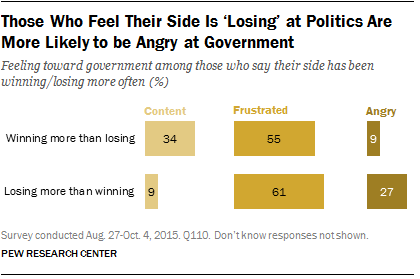 Among those who say their side loses more than it wins politically, 27% are angry at the federal government – three times the percentage among those who feel like their side wins more frequently (9%).